, a distinguished divine, was the son of William Lowth, apothecary and citizen of London, and was born in the parish of St. Martin’s Ludgate, Sept.H, 1661. His grandfather Mr. Simon Lowth, rector of Tylehurst in Berks, took great care of his education, ad initiated him early in letters. He was afterwards sent to Merchant-Taylors’ school, where he made so great a progress that he was elected thence into St. John’s-college in Oxford in 1675, before he was fourteen. Here he regularly took the degrees of master of arts, and bachelor in divinity. His eminent worth and learning recommended him to Dr. Mew, bishop of Winchester, who made him his chaplain, and in 1696 conferred upon him a prebend in the cathedral-church of Winchester, and in 1699 presented him to the rectory of Buriton, with the chapel of Petersfield, Hants. His studies were strictly confined within his own province, and solely applied to the duties of his function; yet, that he might acquit himself the better, he acquired an uncommon share of critical learning. There is scarcely any ancient author, Greek or Latin, profane or ecclesiastical, especially the latter, whose works he had not read with accuracy, constantly accompanying his reading with critical and philological remarks. Of his collections in this way, he was, upon all occasions, very communicative. 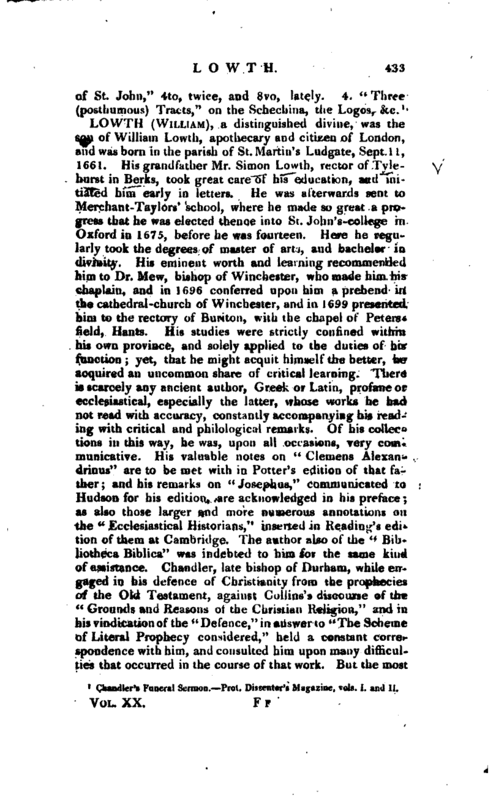 His valuable notes on “Clemens Alexandrinus” are to be met with in Potter’s edition of that fa* ther; and his remarks on “Josephus,” communicated to Hudson for his edition, are acknowledged in his preface; as also those larger and more numerous annotations on the “Ecclesiastical Historians,” inserted in Reading’s edition of them at Cambridge. The author also of the “BibJiotheca Biblica” was indebted to him for the same kind of assistance. Chandler, late bishop of Durham, while engaged in his defence of Christianity from the prophecies o the Old Testament, against Collins’s discourse of the “Grounds and Reasons of the Christian Religion,” and in his vindication of the “Defence,” in answer to “The Scheme of Literal Prophecy considered,” held a constant correspondence with him, and consulted him upon many difficulties that occurred in the course of that work. But the most | valuable part of his character was that which least appeared in the eyes of the world, the private and retired part, that of the good Christian, and the useful parishpriest. His piety, his diligence, his hospitality, and beneficence, rendered his life highly exemplary, and greatly enforced his public exhortations. 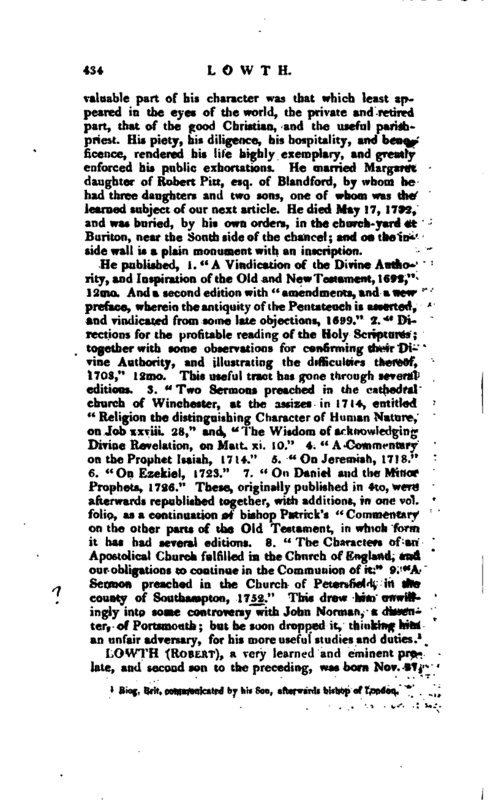 He married Margaret daughter of Robert Pitt, esq. of Blandford, by whom he had three daughters and two sons, one of whom was the learned subject of our next article. He died May 17, 1732, and was buried, by his own orders, in the church-yard at Buriton, near the South side of the chancel; and on the inside wall is a plain monument with an inscription. 1 Brit, communicated by his Son, afterwards bishop of London.